Petrykivka is a traditional Ukrainian decorative style of folk painting named after the village it originated in, Petrykivka in central Ukraine (Dniporopetrovsk province). It was traditionally used to decorate village homes. Since houses were made of natural cob, and whitewashed, they provided a perfect surface for the cheerful and lively flowers and plant motifs distinctive to this style. In this workshop, you will learn about the meaning, cultural significance and health benefits of authentic Petrykivka style folk painting, which has become a hallmark of Ukrainian culture around the world after being inscribed by UNESCO onto theRepresentative List of Intangible Cultural Heritage of Humanity.All ages. Children must be accompanied by an adult. A workshop for beginners: instruments provided and no experience necessary! Get started on playing the diatonic button accordion (AKA melodeon). The workshop will progress from how to hold the instrument to learning some simple folk melodies, and how to play chords to accompany other musicians or to accompany yourself singing. Yoga is a union of body and breath. These sessions are designed for an ever-curious beginner and well-seasoned yoga folks alike. Please bring your mat, blanket/towel and an open mind. Morning and Afternoon sessions. The Finno-Ugric peoples of Northeast Europe, North Asia and the Carpathian Basin who speak languages of the Finno-Ugric group, Finns, Karelians, Estonians, Hungarians, and several others, share an ancient past rooted in a common mythology and worldview. Dalva Lamminmaki, carrier of the myths and traditional teachings of Karelia & Finland will weave together her knowledge of this particular worldview, shamanic tradition, the Kalevala, and folk healing in this workshop. Be awash in story and sound, as you let the old ways of these people and the sound of their drum fall upon your ears. Our summer camp will be offering a number of activities designed with younger people in mind, but with no age limit on participants. These activities include: pottery, body percussion & vocalizing, theatre and so much more. All activities are flexible and will be guided by the interest of the participants. Learn the basics of spinning wool into yarn. Learn about wool and its preparation, from combing and carding, to felting. You'll be guided in spinning on a wheel, but drop spindles are also available. No experience necessary. Beginners welcome. Delve in to a week-long learning experience in the art of reshaping metal with fire, hammer and an anvil. Forging is an ancient art form and craft that combines all four elements that results in creating a structural and artistic items solely limited to one’s imagination. Drawing on several traditions of horticulture, including permaculture, this workshop will present methods of working with the land and its plant life in a way that both honours the natural rhythms of nature and brings the benefits of food and medicine to the human caretakers- the gardeners. You'll be introduced to the camp garden where you'll learn more about tilling (or no-till), composting, mulching, and succession planting. You'll also be introduced to the scythe and the craft of scything, or mowing grass. You'll learn how to hone and peen the blade and tend to this traditional tool. Finally, you'll be guided in harvesting and drying herbs from the camp garden to take home for future enjoyment! Weaving in Ukraine has been done with flax, hemp or woolen threads for many centuries, for clothing, housewares, and ritual towels (rushnyky), much of it in the home, on wooden floor looms. 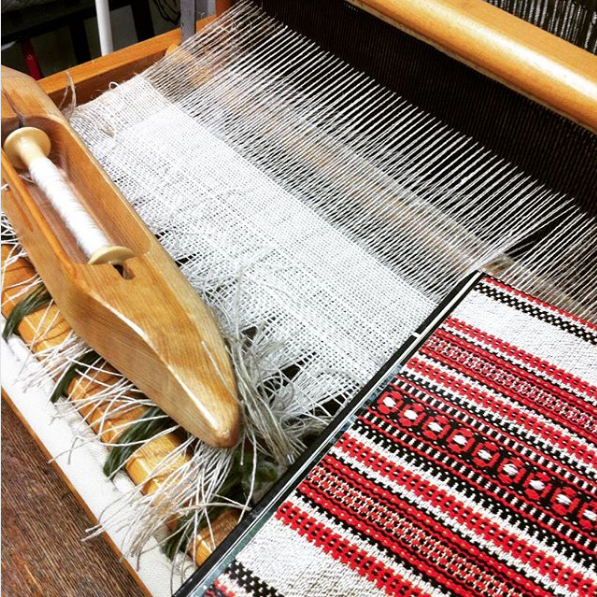 In this workshop you'll have the opportunity to work on a similar floor loom and explore simple traditional Ukrainian patterns made with overshot weaving. No experience necessary. The workshop participants will learn to sing and play the kantele in the Kalevala tradition, focusing on songs collected between 1850 and 1925. Participants will gain an understanding of poetic devices unique to the structure of the Finnic languages, as well as the importance of improvisation, and the influence of surrounding Slavic traditions. Lyric sheets and some kanteles will be available. For this year, I will include material from north and south Karelia learned from Emmi Kuittinen.